Hi, we have seen how some foreigners face exorbitant costs while they visit Albania. Here are some advises on how to save yourself some money. If you visit Albania and land at the Tirana International Airport, you will face a bank offering money exchange. Since obtaining local currency is the first thing to do when you visit a foreign country, scores of foreigners hurry to use this service at the airport. Well, advise is simply, don’t do it at the airport. Albania currency exchange market offers usually excellent conditions for this service. Normal exchange agencies in Tirana (and in most of the country), will accept your euros or dollars or pounds for margins usually less than 1%. That is, if the current mid-market exchange rate for euro for today (10 July 2018) is 125.9 lek per euro, normal agencies in Tirana will purchase euros for 125.5 and sell it for 126.4. This means, their margin is just 0.8%. This is not what happens in banks. There, euros are purchased usually for 120 and sold for 130. That is a margin of 7.7%. The difference is huge. If you spend 100 euros in Albania, using normal exchange agencies will save you some 4 or 5 euros in exchange cost. Such small margins offered by money changers in Tirana are not usual. In most countries, changing your money in local currency cost much more. While experienced travel might find 5% loss in change, such as rates offered by banks “a normal thing”, here it is abnormal. As a rule, banks operating in Albania has exchange margins much larger than those of agencies. In some countries, exchanging money includes a commission instead of a margin in form of difference between buying and selling rates in exchange dealers. In Albania, commissions in exchange agencies or banks are not usual. If someone ask from you a commission to do the job, don’t accept it. Travelers in EU countries have an easy life through bank cards. 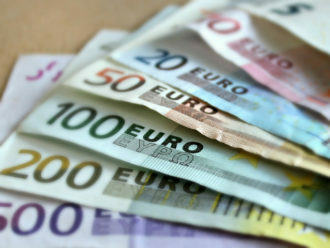 Thanks to European Union regulations, exchange rates and withdrawing commissions are small costs. However, Albania is not an EU Member country so using cards to withdraw money from Albanian banks operated ATMs might contain costs for which you might never learn. There are no clear transparency rules to inform users about the costs of using ATMs in Albania, especially when the process includes exchanges. That is, when you have an euro account linked to a card, ATMs in Albania will most probably give you lek. This includes exchange rates. Some banks in Albania use the normal exchange rate for automated money transfers (e.g. +-0.2% from mid-market rates), but some of the biggest banks use their own exchange rates. You might end up paying the bank 4 or 5 euros per 100 exchanged. The same is true when you use euro or usd denominated cards to pay in POS machines in Albania. It doesn’t happen with all the banks, but the trouble is, there is no easy way to know. As I said, there are no transparency requirements for Albanian banks. The alternative is not really pleasant. Saving these costs might require to hold with you a lot of cash. You might anyway choose to pay the costs anyway. You choose. Despite the fact that Albania’s exchange market is highly competitive and offers very good conditions to exchange major currencies, Albania is also a small country where scores of secondary currencies, such as polish zloty, Swedish Krona and others are hard to sell. Even Macedonian Dinar, which is a neighboring country, is difficult to sell in Albania. As such, dealers might require higher margins for such currencies. (As for banks, forget it. You might lose half of the money in exchange rates). One bank states that it offers to purchase Danish Kroner for 12 lek and to sell it for 24. Mid-market is 17, so they demand a 40% profit for each Kroner exchanged. Albania Central Bank publishes daily its mid-market exchange rates. Here you can find it. Previous articleMore of the same? What now for Albania?